Operational guidelines followed by professionals would not have allowed a circling approach into the weather, terrain and lighting conditions this pilot attempted. This article was first appeared in the December 2012 issue of IFR Refresher Magazine and at www.AvWeb.com, and is cross-posted here with permission. Flying under Part 91 gives us an incredible amount of aviation freedom. Yet, it is this relative freedom from heavy regulation which is largely responsible for General Aviation's safety record, a safety record which seemingly can't be improved beyond a certain point, and frankly a record which is not all that great. No, flying little airplanes is not as safe as flying the airlines. Nor is it as safe as Part 91 corporate flight departments, or Part 135 charter operators, or even the military. However, as little airplane pilots, we can stack the deck in our favor. We do have a choice. We can either use Part 91, to its full legal limits, as our personal operations manual, or we can learn from our safer brethren and voluntarily curtail some of our Part 91 freedom in trade for a safer flight experience. The 61-year-old private and instrument rated pilot was certainly current and one has to assume he had a reasonable level of proficiency based on his recent flight experience and his make and model time. 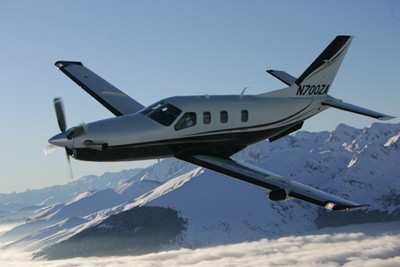 Moreover, considering the aircraft he was flying, the insurance company would likely have required he attend a formal type specific training program at least once per year.Of the 1,738 hours of total time in his logbook, 1,098 were in the make and model aircraft, an EADS Socata TBM-700. The new aircraft was nicely equipped with a G1000 glass cockpit, including data-link weather and a capable autopilot. His time in the make and model also put the pilot well beyond those risky first 100 or so hours when a pilot is learning a new aircraft. In addition, the pilot had logged 86 hours in actual IMC and 98 hours of simulated instrument experience. During the 90 days before the accident the pilot had flown 41 hours, and during the previous 30 days he added seven hours to his logbook, although the NTSB report is somewhat vague on whether his recent flight experience occurred in TBM-700. However, when compared to other pilots with a similar number of flight hours, this pilot was light in one area of operation, night flight -- where he had only 40 hours. Typical pilots average 10 percent of their total time in night conditions, so the accident pilot was well below the average in this aspect. On a Sunday afternoon the pilot began planning for a trip from San Carlos Airport (KSQL), in California, to Truckee-Tahoe Airport (KTRK) in Truckee, California. 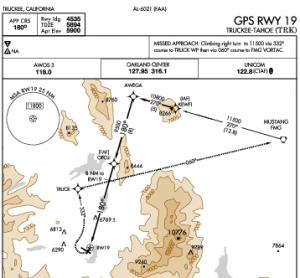 The 169 nm trip would be short, less than an hour in duration at typical TBM-700 speeds. After the accident, the pilot stated he received a weather briefing for the route of flight and for the destination. In addition to weather conditions, the briefing noted Runway 19 at Truckee-Tahoe Airport was closed. The pilot then said he continued monitoring the weather until departure. The weather at Truckee had been varying all day. Snow was falling and conditions fluctuated between marginal VFR to low IFR. The pilot filed an IFR flight plan to depart at 16:10 local time with a planned cruise altitude of 17,000 feet and a true airspeed of 262 knots. Truckee-Tahoe Airport's elevation is 5,900 feet MSL, but that is low compared to some of the surrounding terrain with elevations soaring well above 9,500 feet MSL. That nearby terrain is responsible for Truckee-Tahoe Airport only having two non-precision approaches available -- the VOR/DME RNAV or GPS A approach with circling minimums 2,300 feet above the airport and visibility requirements of 1 1/4 miles; and the GPS RWY 19 approach with a straight in MDA and/or circling minimums 1,500 feet above the airport also with visibility requirements of 1 1/4 miles. Just prior to departure, at 16:30 local, the pilot obtained an update on the Truckee-Tahoe Airport weather. The visibility was greater than 7 miles, the sky was overcast at 2,000 feet, the winds were calm, and runway 19 was still closed. If there would be any chance of making it in, this flight would require the GPS RWY 19 approach, circle to land. The TBM departed and the sun set eight minutes later. During the flight the pilot continued to monitor the destination weather. Thirty minutes into the flight the destination METAR said light snow was falling, and the visibility had increased to 10 miles, but now there were few clouds at 900 feet, a broken layer at 2,000 feet and an overcast layer existed at 5,500. The winds were still relatively calm, out of the west at three knots and the temperature and dewpoint spread was two degrees Celsius. The aircraft was cleared for the GPS RWY 19 approach via the Mustang VOR transition. If the pilot had alternate plans, none were noted in his conversation with investigators or in the NTSB report. As they passed over the airport on the outbound leg of the approach, the pilot's passenger reported seeing the airport below, but since the pilot didn't see it he continued with the instrument approach procedure. At about this time, Truckee-Tahoe Airport's METAR noted dropping weather conditions. The winds had shifted, they were out of the east at four knots, the lowest layer of clouds was now scattered at 500 feet and the broker layer was at 1,500 feet, but more significant was the visibility, it had dropped to 3/4 of a mile in light snow. This reported drop in visibility may not have been known to the pilot. During an interview with investigators, the pilot mentioned his last AWOS report noted seven miles visibility. Ceilings at the time were between 1,500 and 2,400 feet. In snow shower conditions the visibility can go from good to horrendously low in no time flat. Further, the snow shower conditions can be extremely localized, sometimes only affecting an area as small as a few hundred feet across. When the aircraft reached the missed approach point, the pilot saw the runway environment and must have believed he was in VFR conditions and could remain in those conditions. The pilot promptly cancelled IFR and elected to proceed visually with his circle to land procedure. In these variable conditions canceling IFR may not have been the safest choice. As the pilot entered a left VFR downwind for runway 28 he discovered that the first part of his intended runway was covered in fog. Rather than re-establish contact with a controller for an IFR clearance to somewhere, the pilot elected to land long just beyond the fog. The pilot figured there was at least 5,000 feet of runway remaining. More than likely this impromptu maneuver had never been practiced or thoroughly thought through by the pilot. Just prior to touch down the pilot noticed he was too high and too fast for the runway remaining and he began a go-around procedure. The pilot reported to investigators that he "was totally focused outside the plane because of the clouds and mountains, but had no horizon reference in the dark." The aircraft stalled wings level into trees, terrain and snow. Fortunately the pilot and his passenger only sustained minor injuries. 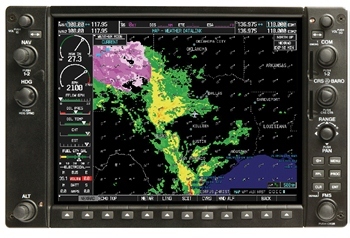 The cockpit equipment which is currently available to General Aviation pilots far surpasses what is in many airline, corporate and military cockpits. You would think this additional situational awareness and autopilot assistance would make everything safer, but sadly the numbers don't bear that out, and many regulators are clamoring for more regulation including a rating to fly these technically advanced aircraft. We are at a crossroads in Part 91 General Aviation. We can take it upon ourselves to voluntarily raise our personal standards, our personal operations manual and minimums, so to speak -- to set our standards beyond the minimums of Part 91 in order to make GA flying safer. Or, we may have to accept the regulations which will surely follow after each notable accident we create. Manage your risk, and borrow from the professionals who fly and train everyday. The operation manuals and regulations those professionals are required to follow would not have allowed a circling approach into the weather, terrain and lighting conditions this pilot encountered, much less a spur-of-the-moment midfield landing attempt. We currently have the freedom to choose the aviation safety path we wish to follow. Let's choose wisely, so our Part 91 General Aviation freedom isn't regulated away. Armand Vilches is a commercial pilot, instructor and FAASTeam member who lives in Brentwood, TN. He brings an extensive background in risk management and insurance to aviation and flight instruction.